When it appeared in 1923, John Lord’s Capital and Steam Power 1750–1800 was the first book to be based on the voluminous Boultori and Watt papers in Birmingham since the hey-day of Samuel Smiles. Although Lord’s conclusions have been modified and corrected on various points, this book still remains the best short account of the significance of this classic engineering partnership which bulks so large in the history of technology and of the Industrial Revolution in Britain. 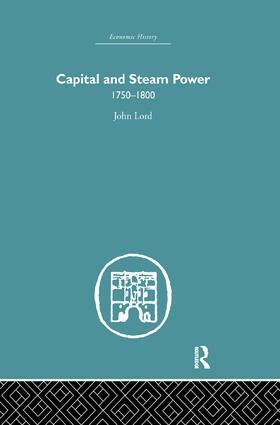 "Mr. Lord’s Capital and Steam Power 1750–1800 is an important contribution to economic history … His introductory sketch of economic conditions from 1700 to 1750 and his concluding summary of the main results of the developments which he has described, without having the same novelty as his central theme, are scholarly and intelligent." "His study of the application of steam to industry is a useful piece of research." Routledge Library Editions: Economic History reprints some of the most important works on economic history published in the last century. For further information on this collection please email info.research@routledge.co.uk.